It's soft! It's silly! It even moos! 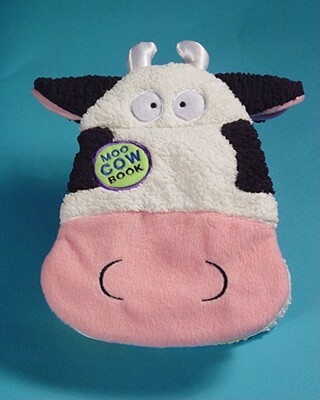 Here's a spiffy plush cow book with a squeeze-it moo, a vivid pink terry cloth tongue, dazzling satin teeth, and four padded cloth pages of jaunty rhyming text. Sort of a book, sort off a toy, sort of a blankie, Boynton's Moo Cow Book is an absurdly soft companion for the smallest of book lovers -- for car rides, for quiet times, for right this moment. Perfect for babies, toddlers, and sensitive high-powered executives.